Though winter has been mild so far, it has still been a little too cold to get outdoors. This past week, Tyler, Amy and I decided to visit JAK&apos;S Warehouse in Schererville for a little friendly communication department competition. Read below to learn about some of our experiences. When you talk a big game, it doesn&apos;t matter the size of the court or the size of the course. You have got to bring it. JAK&apos;S Urban Golf mini golf course was the perfect opportunity for me to eat my words. I warned the ladies that they were about to face imminent mini golf doom at the hands of my putter. I think my putter was probably broke, though. Now, I&apos;ll be the first to admit it that a +5 on hole two isn&apos;t good. Sure, my overall score was similar to the weight of a medium sized dog. Is that necessarily bad? Yes, for mini golf it is actually quite terrible. I talked a big game and was stunned in defeat by both Amy and Staci. The black-lighted nine-hole Urban Golf course underneath the Laser Tag field is decked out in glow-in-the-dark paint and vicious approaches. Humvees burst through the sides of the walls with an overall course vibe eerily similar to World War Z. The course is dark and challenging like coffee in the morning without cream. Believe me when I say that it is much harder getting an ace when the holes are surrounded by devious bumps on the pitch. The rounds are quick and a nice escape for relaxation after running around The Warehouse. Your best bet with the mini golf is to experience it after you purchase your JAK&apos;S Ride Plus wristband. This way, you get four hours of fun with all of the best attractions at JAK&apos;S and you can recoup your energy after being tuckered out on Laser Tag or Go-Karts. Of all the upsets throughout the day, the greatest might have come at our first stop inside JAK&apos;S Warehouse. We had just seen an air hockey table, and once that happens, you can&apos;t just walk away from it. Immediately I challenged Staci and Amy to an air hockey tournament. If you lost twice, you were out of the tournament. Would you believe it that I lost in the first round to Staci? To Staci! It&apos;s easy to feel down and out after losing the first round in a tournament. Believe me, I was down, but not out. I rallied back in game two against Amy (with the help of about six self-goals) and was ready to redeem myself against Staci. The stage was set after Staci eliminated Amy. I could have my redemption! The game started and I scored within the first six seconds like a natural. I was feeling good and fear was in Staci&apos;s eyes. Even the air blowing from the hockey table couldn&apos;t cool off Staci. I was a man on a mission for redemption, but guess what happened? After one goal (only one goal!) the puck became stuck in the machine! We couldn&apos;t get it out and we had to scrap the tournament to live in a world of hypothetical situations. We all know that I would have won, right? Right! Even though I&apos;ve been able to drive a real car for decades, go-karts still give me a thrill. I think it has something to do with my ability to have the pedal to the metal, with no fear of serious repercussions when I "accidentally" hit another driver. Ah, freedom at 5 m.p.h. My communications department comrades and I had a blast zipping around the track at JAK&apos;S. Even though I started out in first place amongst the three of us, I had a few other drivers get in my way, resulting in a 3-car pileup. While I was untangling my car from the mess, Tyler and Staci passed by me, waving and smiling as they went. As hard as I tried, I couldn&apos;t catch up to those two! Staci ended up the victor, with Tyler a close second. Even though I lost this race, I had a great time and can&apos;t wait to meet those guys on a track again! 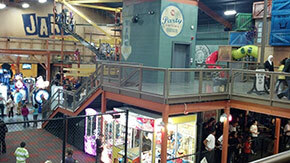 I&apos;ve never done a ropes course before, so I was eager to try out JAK&apos;S Sky Trail. It&apos;s four stories of climbing and balancing fun. I have a slight fear of heights, so to challenge myself, I decided I had to go all the way to the top. I enjoyed the second level and practiced on that for a while, noticing that Tyler had already made his way up to the top level and was confidently walking across the different ropes like he was a monkey. The third level challenged me a bit more, but nothing like the fourth level! I was literally breaking out in a sweat trying to maneuver myself across the rope while looking down four stories to the ground. Although I was confident that the harness would hold me, I still was worried about slipping. I was very proud of myself when I succeeded in making it across the fourth level. I may not be a monkey like Tyler, but I still had a great time! My favorite activity at JAK&apos;S was, by far, laser tag. I had only played once before, and had absolutely loved it. I was really excited for the chance to stealthily take my communication department buddies down. As we walked in the room to gear up, Tyler, Amy and I found ourselves on the same team. We decided to just go by the score at the end of the game to determine a winner. There were quite a few other players for both teams, so the battle was sure to be great. Inside the arena, JAK&apos;S has numerous walls and structures to hide behind, as well as corners to tuck yourself into. The room was dark with a black light, making the atmosphere even more fun. Fast-paced electronic music filled the playing field, setting the perfect mood for this futuristic combative game. At the end of our first session, I was able to prevail against the other communication team members. I ducked, hid and stayed calm to systematically take down the red team, though red ultimately beat blue. After a few different activities, Tyler, Amy and I decided we needed a snack, so we headed up to the second level to see what was available. 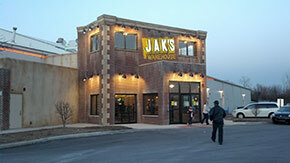 The menu at JAK&apos;S Warehouse offers many delicious items, including pizza, nachos, soups and salads, corn dogs, popcorn and more. Also available are ice cream treats, a variety of sodas and tea, and icees. Amy and I decided to share an order of the day&apos;s special - loaded tater tots. The perfectly prepared tater tots arrived piled high with melted cheese sauce, sour cream, green onions and bacon. Amy also ordered an iced tea, and I had a Mountain Dew. We could not get over how delicious the loaded tots were. Amy was determined to recreate the snack at home. It would be perfect for a "stay home and enjoy movies" night. Tyler order popcorn and an icee. The popcorn was made fresh to order, and the icee looked cool and refreshing. All in all, we had a great time! In addition to the activities we talked about, Tyler, Amy and I also enjoyed many different arcade games and Laser Maze. It was the perfect way to spend the afternoon and it was full of giggles and friendly smack talk. Whether you&apos;re thinking about taking kids, or looking for some adult fun, all three of us would highly recommend and outing to JAK&apos;S Warehouse!